The war of the Revolution was no sooner ended than the attention of great numbers of enterprising men was again turned to the settlement of the fertile regions west of the Alleghanies. The vast domain out of which the States of Ohio, Indiana, Illinois, Michigan, and Wisconsin have since been formed was organized as the North-western Territory, by virtue of an ordinance of Congress in 1787. In the following year, Marietta, Ohio, was settled by emigrants from New England, and a stockade fort was erected as a protection against the Indians. Settlements were soon afterwards begun at Columbia and at Cincinnati, where Fort Washington was built in 1790, and within two years twenty thousand people had established themselves in Ohio. This territory, it must be borne in mind, had, by the ordinance of 1787, been confirmed to the Indians "forever," and its establishment and settlement naturally aroused the jealousy and hostility of the lake tribes. Under the lead of the celebrated Brant, these tribes formed a confederacy, and repudiated the treaties ceding their lands made by some of them, on the ground that they were made without proper authority "by a few of their young men," and insisted on the Ohio River being made the boundary between the Indians and the United States. The British authorities in Canada easily persuaded them to take this attitude, as they were determined to prevent the United States from gaining control of the upper lakes, and the valuable fur-trade of the country around them, then wholly in Canadian hands. The tribes on the Wabash, numbering two thousand warriors, had taken part in none of the treaties, and were decidedly hostile. They were constantly engaged in waylaying the boats in which emigrants were descending the Ohio, and in raids upon the Kentucky settlers, and were in their turn invaded and scourged by them. General Arthur St. Clair, a brave revolutionary veteran, had been appointed governor of the North-western Territory. Early in 1789 he held a council at Fort Harmar, at the mouth of the Muskingum River, with the Six Nations, and also with representatives of the Wyandots, Potawatomies, Delawares, Ottawas, Ojibwas, and Sacs. Treaties were then made fixing boundaries, and payments for ceded lands. But the great bulk of the tribes above-named refused to acknowledge their validity, and within a few weeks after they had been made were out on the war-path. Within four years one thousand five hundred persons had been killed or captured, and a large amount of property destroyed. The simple log-cabin of the pioneer settlers, who bore the brunt of Indian hostilities upon our western frontier, contained such furniture only as was wholly indispensable and of domestic manufacture. Its roof was composed of strips of bark. Articles of clothing, hung on wooden pegs around its walls, served in some degree the purpose of paper-hangings or tapestry, and were also an indication of the wealth or poverty of the family. The usual dress of the pioneer was the hunting-shirt of linsey or deer-skin, fastened by a belt, leggings and moccasins, also of deerskin, and a fur hat. Wooden bowls, trenchers, and noggins, or, in the absence of these, gourds and hard-shelled squashes, together with a few pewter plates and spoons, constituted the table furniture. The iron pots, knives, and forks were brought from the East, along with the salt or iron, on pack-horses. These articles of furniture correspond very well with the kind of diet on which they were employed. Hog and hominy were common dishes. Johnny-cake and pone were at first the only forms of bread for breakfast and dinner; for supper, mush-and-milk was the standard dish. When milk was wanting, the substantial dish of hominy had to supply its place. Every family had, besides a small vegetable garden, an enclosure called a "truck patch," in which were raised pumpkins, corn, squashes, beans. and potatoes. These were cooked with pork, venison, or bear-meat for dinner. A remarkable instance of female heroism occurred at this time in Nelson County, Kentucky. The barking of his dogs led John Morrell to open his door to ascertain the cause of their uneasiness. He was fired upon, and fell back into the house wounded. The savages attempted to rush in after him, but Mrs. Morrell, and a daughter about fifteen years of age, barred the door. The assailants soon made a breach in the door with their tomahawks, and one of them attempted to squeeze himself through into the room. The courageous wife seized an axe, gave him a fatal blow, and then dragged him through the opening into the house. This was repeated until four were slain. By this time the Indians had discovered the fate of their companions, and, after a consultation, two of them mounted to the roof and began to descend the broad, wooden chimney. Aware of the impending danger, the wounded man ordered his little son to cut open a feather bed and throw the contents upon the fire. This was done. Down came the two intruders, scorched, suffocated, and nearly insensible. Mr. Morrell had strength enough remaining to aid his heroic wife in despatching them, while she also continued to guard the door with uplifted axe. Another savage who attempted to enter was saluted with such a blow as drove him away howling. One of the surviving Indians, on returning to his town, was asked what was the news. "Bad news! bad news!" he exclaimed; "the squaws fight worse than the Long Knives." The swords worn by the Virginians caused them to be nicknamed "Long Knives" by the Indians. The story of Captain William Hubbel's descent of the Ohio River in a flat-boat, affords a striking illustration of the dangers attending emigration in the West at this time. The party were on their way to Limestone, Kentucky, and before reaching the mouth of the Great Kenawha numbered twenty persons�nine men, three women, and eight children. As Indian attacks were expected, the men were divided into three watches, each to be on the lookout two hours at a time. The arms were put in the best possible condition for service, and it was arranged that in case of an attack, the women and children should lie down on the cabin floor, and be protected as much as possible by the trunks and other baggage. Just at daylight one morning a plaintive voice from the shore informed them that some white persons wished to obtain a passage in their boat. This was a common Indian artifice, and its only effect was to place the party more completely on their guard. Soon the Indian canoes were seen, through the mist of the morning, rapidly advancing. Preparations to receive them were promptly made. The chairs, tables, and other encumbrances were thrown into the river, in order to clear the deck for action. Each man took his station, and was ordered not to fire till the savages had approached so near that, in Captain Hubbel's words, "the flash from his gun might singe their eyebrows." Especial caution was given that the men should fire successively, so that there might be no interval. Each of the canoes contained twenty-five or thirty Indians. As soon as they were within musket-shot, they began a general discharge, by which two of the whites were dangerously wounded. Taking their positions at the bow, the stern, and on the right side of the boat, they raked her in every direction. A regular and constant fire was kept up on both sides. Just as the captain was raising his gun for the third shot, a ball passed through his right arm and for a moment disabled him. Scarcely had he recovered from this shock when the Indians at the bow attempted to board the boat, some of then having already taken hold of its side. Severely wounded as he was, Hubbel caught up a pair of pistols and rushed forward to repel them�the boat had no accommodations for that class of boarders. On his approach the Indians fell back, the foremost one receiving the contents of Hubbel's pistol. After discharging the second pistol, he wielded a stick from a pile of firewood so energetically and effectively as to drive the Indians from the boat, wounding one of them severely, and with a yell they suddenly gave way and temporarily discontinued the contest. There were now but four men left unwounded in the boat, the captain himself having two severe wounds. A second attack was nevertheless resisted with vigor and success. Whenever the Indians would rise to fire, their opponents would generally give them the first shot, which was in almost every instance effective. Notwithstanding the disparity of numbers and the exhausted condition of the defenders of the boat, the Indians at length appeared to despair of success, and the canoes successively returned to the shore. Just as the last canoe was departing, Captain Hubbel called to the Indian in its stern, and as he turned around fired on him. When the smoke had dissipated, the Indian was seen lying on his back, and appeared to be severely, perhaps mortally, wounded. Unfortunately, the boat now drifted to within twenty yards of the shore, and the Indians came running down the bank. Two men, the only ones unhurt, took the oars; they were hidden from view, and protected by the side of the boat and by blankets in her stern. The others lay down, to avoid the enemy's bullets. For twenty minutes they were exposed to a heavy fire. Suddenly, and providentially, the boat was carried by the current to the middle of the stream, out of the reach of the enemy's fire. The little band of men, women, and children, now out of danger, forgot their fatigue and wounds, and gave three hearty cheers for their deliverance. Out of nine men, three were killed and four severely wounded. The women and children were all uninjured, except one little boy who, after the battle, came to the captain, and with great coolness requested him to take a ball out of his head. A bullet had gone through the side of the boat and lodged under the skin of his forehead. When this was removed the brave little fellow said, "That is not all, captain;" and raising his arm, exhibited a piece of bone at the point of his elbow, which had been shot off and hung only by the skin. His mother, who had known nothing of all this, now exclaimed, "Why did you not tell us of this" "Because," replied the little hero, "the captain ordered us to be silent during the fight, and I thought you would make a noise if I told you of it." The boat reached Limestone that night. Crowds of people came to see her, and her little band of resolute and heroic defenders. On examination, it was found that the sides of the boat were literally filled with bullets and bullet-holes. In the blankets, which served as curtains in the stern, there were one hundred and twenty-two holes, in a space five feet square. Out of five horses that were in the boat, four were killed. This formidable resistance had a good effect, as it is believed that no boat was ever afterwards assailed by Indians on the Ohio. As the Indian would not submit to having his best hunting-grounds taken from him without his consent, it was necessary to resort to force and to chastise him into submission. One thousand four hundred men, under General Josiah Harmar, were despatched to the heart of the hostile Indian country, around the head-waters of the Maumee. They gained the Indian encampment at the Maumee Ford unobserved, on the morning of October 21st, but were discovered by the Indians in time to frustrate Harmar's plan of surprise, and were themselves defeated in two separate engagements, and driven back with loss, mainly through the superior abilities of the Miami chief, Little Turtle. The flourishing city of Fort Wayne, at the confluence of the St. Mary's and St.. Joseph's, is near the scene of Harmar's defeat. Blue Jacket, an influential Shawnee chief, was associated with Little Turtle in the command of the Indians engaged. In these conflicts many of the Indians fought on horseback. A bunch of bells, hanging down the left side, and two narrow strips of red and white cloth as pendants, decorated their horses' heads. The Indians themselves were painted red and black, in the most hideous manner. Their repulsive appearance, the noise of the bells, and the flapping of the pendent strips of cloth so frightened the horses of the militia that it was with the greatest difficulty that they could be brought to the charge. The regulars, who stood firm, were nearly all killed. The Indians remained on the field during the night, and held a dance of victory, exulting, with frantic shouts and gestures, over their dead and dying enemies. Captain Armstrong of the regulars was a wretched and unwilling witness of this orgie, being sunk to his neck in mud and water within one hundred yards of the scene. To punish the Indians and repress their hostile incursions, General Charles Scott, of Kentucky, with eight hundred men, crossed the Ohio in May, 1791; and penetrated the Wabash country to the large village of Outanon, eight miles below the present town of Lafayette, Indiana. A strong party of Indians was routed with loss, the town, together with several villages in the vicinity, was destroyed, and the country desolated. Another expedition led by General James Wilkinson, in the following August, to the vicinity of what is now Logansport, Indiana, had similar results. These raids had little other effect than to irritate the Indians, who, under such able leaders as Little Turtle, Blue Jacket, and Buck-on-gahelas, redoubled their efforts to drive the whites south of the Ohio. The attempt was now made to establish a strong military post in the heart of the Miami country, on the site of the present city of Fort Wayne. Governor St. Clair, with General Richard Butler as second in command, moved forward at the head of two thousand men to effect this object and bring the Indians to terms. On the morning of November 4th the army was encamped on the borders of one of the tributaries of the Wabash, on a piece of rising ground with a fordable stream forty feet wide in its front. The encampment was surrounded by woods, dense thickets, and the trunks of fallen trees, with here and there a ravine�the best kind of ground for Indian warfare. St. Clair's army, somewhat reduced by desertion, lay in two lines, seventy yards apart, with artillery in the centre of each line. The men slept on their arms, Indians being known to be near. There were two thousand of them, under the famous chief, Little Turtle, close at hand, lying in wait. For days they had been watching for a favorable opportunity to attack the troops. That opportunity had now come. Half an hour before sunrise, while the troops were preparing breakfast, the Indians, with terrific yells, dashed upon the militia who were posted in front across the stream. Stricken with panic, the militia rushed wildly across the creek into the lines of the regulars, producing alarm and confusion among them. The Indians pressed them closely, and then attacked the regulars. Not an Indian was to be seen, except as he darted from cover to cover. More than once the foe were driven back with the bayonet, but they at length succeeded in shooting down all the artillerists and silencing the cannon. General Butler had received a wound, which was being dressed, when a daring savage darting into the camp tomahawked and scalped him. He failed, however, to carry off his trophy, being instantly slain. For nearly three hours, and until one-half of them had fallen, the Americans continued the contest. Then, under cover of a desperate charge, they began a retreat which soon became a flight�the Indians in close pursuit, and greatly elated by their victory. In this battle a larger number of Americans fell than in any of the battles of the Revolutionary War. It was lost by the want of discipline among the men, who had been but a short time in the service. Many gallant officers were slain. St. Clair, who behaved gallantly, had three horses shot under him. Eight balls passed through his coat and hat. Winthrop Sargent, his adjutant-general, was severely wounded, and carried two bullets in his body received in this battle to his grave. The news of St. Clair's defeat produced consternation along the border, checked for a time the tide of emigration to the Ohio, and cast a gloom over the whole country. An investigation into the conduct of that officer resulted in his honorable acquittal. Washington, whose parting injunction to St. Clair had been, "Beware of a surprise," was extremely agitated on hearing of his defeat, and gave way to an outburst�most unusual to him�of passionate invective. Soon recovering himself, however, he said, "General St. Clair shall have justice. I will receive him without displeasure; I will hear him without prejudice; he shall have full justice." It is certain that St. Clair continued to retain his undiminished esteem and confidence. "When you return to your country, tell your people that it is my desire to promote their prosperity by teaching them the use of domestic animals, and the manner in which the white people plough and raise so much corn; and if, upon consideration, it would be agreeable to the nation at large to learn those arts, I will find some means of teaching them at such places within their country as shall be agreed upon." Anxious for peace, commissioners on the part of the United States met the tribes in a general council, in the spring of 1793, and proposed that in consideration of the ceded lands, some of which had already been sold, the United States should pay the Indians a large sum of money, or goods, besides a full yearly supply of such articles as they needed. 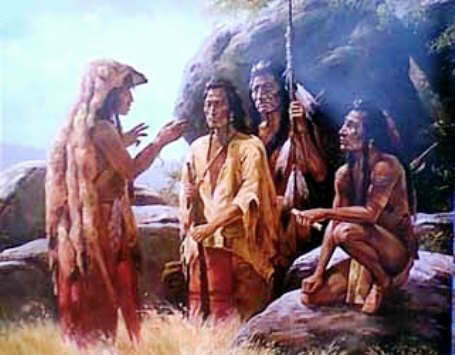 In reply the Indians said that money was of no value to them, and they pointed out the following simple mode by which the settlers might be removed and peace be restored. From the Indian point of view, the wisdom and justice of their proposal cannot be questioned. "We know that these settlers are poor," said they, "or they would never have ventured to live in a country which has been in continual trouble ever since they crossed the Ohio. Divide, therefore, this large sum of money you offer us among these people. Give to each, also, a proportion of what you say you will give to us annually, over and above this very large sum of money, and we are persuaded they will most readily accept it in lieu of the land you sold them. If you add, also, the great sums you must expend in raising and paying armies, with a view to force us to yield you our country, you will certainly have more than sufficient for the purpose of repaying these settlers for all their labor and improvements. "You talk to us about concessions. It appears strange that you should expect any from us, who have only been defending our just rights against your invasions. We want peace. Restore to us our country and we shall be enemies no longer." A final expedition against the North-western Indians was intrusted to General Anthony Wayne, whose impetuosity and daring at Stony Point and on other Revolutionary fields had procured for him the title of "Mad Anthony." Profiting by its dear-bought experience, the Government gave him a force adequate to the performance of the grave task before him. William Henry Harrison, afterwards a successful soldier of the war of 1812, and ninth President of the United States, joined him as aide-de-camp. Wayne took ample time for preparation. Late in October, with a force of three thousand six hundred and thirty men, he reached the site of Greenville, and went into winter-quarters. In the following summer he was joined by General Charles Scott, with one thousand six hundred mounted volunteers from Kentucky. He then moved forward, skirmishing with bands of lurking savages as he advanced, but so slowly and stealthily that the Indians nicknamed him "The Black Snake." He marched with open files, to insure rapidity in forming a line or in prolonging the flanks. and drilled his men to load while marching. He kept his forces well together, always halting in the middle of the afternoon, and encamping in a hollow square. A rampart of logs sun rounded his camp. On arriving at the site of the present village of Defiance, at the confluence of the Anglaize and Maumee rivers, where were several important Indian villages, Wayne erected a strong work which he named Fort Defiance, and renewed peaceful proposals to the Indians. These they rejected, contrary to the advice of Little Turtle. Blue Jacket, the principal Indian leader in the coming battle, threw all his influence in favor of war. "We have beaten the enemy twice," said Little Turtle, "under separate commanders. We cannot expect the same good-fortune always to attend us. The Americans are now led by a chief who never sleeps. The night and the day are alike to him, and during all the time that he has been marching upon our villages, notwithstanding the watchfulness of our young men, we have never been able to surprise him. Think well of it. There is something whispers me it would be prudent to listen to his offers of peace." Taunted with cowardice for this sagacious counsel, he answered the false charge by being foremost in the battle that ensued. Wayne ordered his men to charge with the bayonet and rouse the Indians from their lair, and when up, to deliver a close and well-directed fire on their backs, followed by a brisk charge, so as not to give them time to reload. General Scott, with his mounted volunteers, was directed to turn the right flank of the enemy by a circuitous movement, while Colonel Campbell, with the legionary cavalry, effected the same object on their left flank. Such was the impetuosity of the troops, as they leaped and scrambled over the Indian breastworks, that the enemy fled precipitately and was driven with severe loss more than two miles through the forest. Wayne's second line was unable to come up in season to take part in the action. In this battle all the Wyandot chiefs, nine in number, were killed. The influence of this decisive victory was felt throughout the West, and especially by the hostile tribes. They were now thoroughly convinced of the superiority of the white man and the necessity for peace. For fifteen years they remained quiet, and the North-western Territory was rapidly filled with an enterprising and hardy population. Another important result of Wayne's success was the surrender to the United States of Niagara, Detroit, Mackinac, Miami, and other posts within its territory hitherto held by the British. Moving his army to the Maumee, Wayne built, just below the confluence of the St. Mary's and St. Joseph's rivers, a strong work, afterwards called Fort Wayne. Foremost among the tribes who now turned their steps towards his camp, was the proud and influential Wyandots. The Delawares followed�bitter enemies of the whites since they had been driven from Pennsylvania. Then came the Shawnees, the most subtle and revengeful of all the tribes. Each day witnessed the arrival of these forest delegates, decked with all their peculiar ornaments of feathers, paint, silver gorgets, trinkets, and medals. The Miami, Ojibwas, Ottawas, Potawatomies, Weeas, Kickapoos, Piankeshays, and Kaskaskias were also present. Each delegation bore the pipe of peace, and expressed pacific desires. The camp presented a picturesque appearance, and an unusual number and variety of Indian costumes. The important treaty of Greenville was now concluded by Wayne with the North-western Indians, by which they ceded twenty-five thousand square miles of territory to the United States, besides sixteen separate tracts, including lands and forts. While here the American commander earned yet another nickname from the Indians. His promises of goods and provisions were so tardily executed by the Government, that they called him "General Wabaug," by which they meant "General To-morrow." Mishikinakwa, or Little Turtle, the leader of the Indians in these campaigns, was of mixed blood, being the son of a Miami chief by a Mohican mother. He was sagacious, humane, and brave. One who saw him soon after the war described him as about six feet in height, of a sour and morose expression of countenance, with an appearance also of craft and subtlety. He wore a blue petticoat that came half-way down his thighs, a European waistcoat, surtout, and moccasins. On his head was a cap that hung half-way down his back, bespangled with about two hundred silver brooches. In each ear were two rings, the upper part of each bearing three silver medals about the size of a dollar, and the lower parts quarters of a dollar. They fell more than twelve inches below his ears. One from each ear fell over his breast, the other over his back. He had also three large nose jewels cunningly painted. Kosciusko, the Polish hero, when in Philadelphia in 1797, on taking leave of Little Turtle, gave him an elegant pair of pistols and a valuable robe made of the fur of the sea-otter. Little Turtle kept the Miamis faithful to the Americans from the time of the treaty. After his death at Fort Wayne, in the summer of 1812, the great body of them again became hostile. Colonel Johnston, who knew Little Turtle well, called him "the gentleman of his race." A bolder or better planned escape from captivity and the stake than that of Samuel Davis, an Indian spy, has nowhere been recorded. Knowing that he was to be burned or tortured to death, Davis determined to seize the first opportunity of escape that offered, or to die in the attempt. At night he was tied tightly around the waist with a strong strip of raw-hide. Each end was fastened around an Indian's waist, so that he could not turn over without drawing an Indian with him. He had to lie on his back until morning, and if he made the least stir he was quieted with blows. One morning, just as it was growing light, he jogged one of the Indians to whom he was fastened, and requested to be untied. Seeing that it was growing light, and that a number of the party were about the fires, the Indian untied him. Davis rose to his feet. Looking about him, to determine the best direction to take for escape, he saw that to plunge through the group before him would give him an advantage, as their guns were in the other direction, and they would therefore have to run back for them, and in the dim twilight would be unable to draw a "bead" on him. Screwing his courage up, he felt that all depended on the swiftness of his heels. A large active Indian was standing between Davis and the fire. Striking him with all his force he knocked him into the fire, and, with the agility of a deer, the sprang over his body, and took to the woods at full speed. The Indians followed, yelling and screeching like demons, but, as Davis anticipated, not a gun was fired. Several Indians pursued him some distance, and for a time it was a doubtful race. The foremost Indian was so near him that at times he fancied he felt his clutch. At length, however, he began to gain ground upon his pursuers. On reaching the top of a long, sloping ridge, he for the first time looked back, and to his infinite delight saw no one in pursuit. He now slackened his pace and went a mile or two farther, when he found his feet were so gashed and bruised that he was obliged to tear his waistcoat in two pieces and wrap them around his feet instead of moccasins. Pushing his way to the Ohio, he reached it about the 1st of January, having been for three days and two nights without food, fire, or covering, exposed to the winter storms. Here, to his great joy, he saw a boat coming down the stream. The boatmen heard his story, but refused to land, fearing deception. Keeping pace with the boat, as it slowly glided along, the more pitiably he described his forlorn condition the more determined were the boat's crew not to land for him. He at length requested them to come a little nearer the shore, and he would swim to them. To this they consented, and, plunging into the freezing water, Davis swam for the boat. The boatmen pulled vigorously towards him, and at length lifted him into the boat almost exhausted. He soon recovered his usual health and activity. "The manner in which I used to work was as follows: On all occasions I carried my rifle, tomahawk, and knife, with a loaded pistol in my belt. When I went to plough, I laid my gun on the ploughed land, and stuck up a stick by it for a mark, so that I could get it quick in case it was wanted. I had two good dogs. I took one into the house, leaving the other out. The one outside was expected to give the alarm, which would cause the one inside to bark, by which I would be awakened, having my arms always loaded and at hand. "I kept my horses in a stable close to the house, having a port-hole, so that I could shoot to the stable door. During two years I never went from home with a certainty of returning, not knowing the moment I might receive a ball from an unknown hand; but in the midst of all these dangers, that God who never sleeps nor slumbers has kept me." "During one of the Indian raids on a frontier settlement," says an eye-witness, "the inhabitants fled in the darkness to the central block-house. One of them, a Mr. Moulton, came with his leather apron full of smith's tools and tobacco; his daughter, Anna, brought the china; Lydia, another daughter, brought the great Bible. But when all were in the mother was missing. 'Where was mother!' was the anxious inquiry; 'she must be killed by the Indians.' 'No,' says Lydia, 'mother said she would not leave the house looking so, she would put things a little to rights.' After a while the old lady came, bringing the knives, forks, looking-glass, etc., and having the immense satisfaction of knowing that the deserted dwelling had been made presentable in case the savages looked in." This story of Tecumseh and the War of 1812 is featured in the book entitled the Indian History for Young Folks by FrancIs F. Drake and was published by Harper Brothers in New York and London in 1919.